WebHostingHub is the sister company of InMotion hosting. 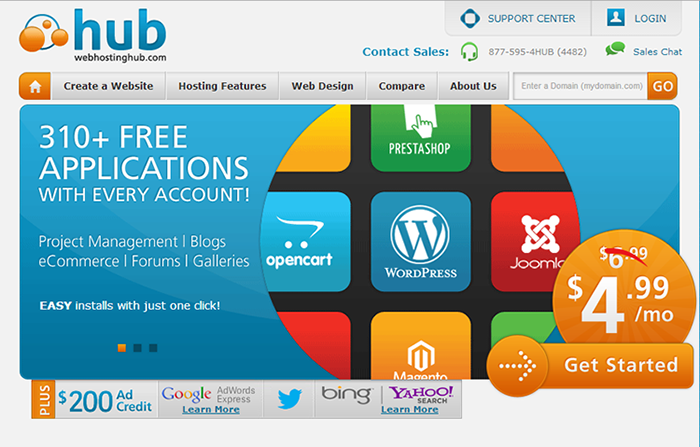 Where InMotion is specialized for business websites, WebHostingHub is more suited for personal websites. They offer a user friendly shared hosting package which is ideal for beginners who are looking to start a website for the first time. They have built a strong reputation for being a reliable, easy to use web host. Like InMotion, WebHostingHub customers have their choice of East or West coast server location, but unlike InMotion, WebHostingHub only offers one, all inclusive shared hosting package which starts at $4.99/month. This is a bit more expensive than some of WebHostingHub’s competitors, but they include plenty of features for this price. As the #4 host on my top 5, WebHostingHub is a very good option, especially for beginners or those looking to host personal blogs and other lower traffic websites. They only offer one, all inclusive shared hosting option which has all the features included that are necessary to run a successful personal website. Unfortunately, this one plan does not include a private SSL certificate or dedicated IP address, so if you plan on hosting a business website that accepts credit card payments you will want to look for another host. This is the only thing that holds WebHostingHub back from its competitors. WebHostingHub is a bit pricier than their competitors. While this is a bit of a drawback for first time web hosters who are looking for an inexpensive way to start a website, the features they offer at this price is beneficial to the advanced website owner. They also offer the least expensive domain renewals, as well as a 90 day money back guarantee which is the best in the business. While these prices are relatively high for a non-business package, there is some justification for it. The biggest downside with the price is that you need to sign up for 3 years in advance to get the least expensive option. WebHostingHub offers a good list of features. One thing I don’t like is that they offer “Unlimited” disk space and bandwidth that isn’t actually unlimited. If you read through the terms of service you will see policies explaining that unlimited isn’t really unlimited. This is no different from any other host offering unlimited resources. Other than that, they offer everything you would need to run a website properly. The one feature that sets them apart is that all customers get an “on-boarding” call where a support representative will walk you through setting up your account. It’s a nice touch for beginners who don’t have any experience with web hosting. WebHostingHub is relatively reliable. My test account had an uptime of 98.94% over a 4 month time span. My one concern is the lack of an uptime guarantee with WebHostingHub. When I contacted their live chat about it the support rep beat around the bush when I asked about a guarantee. On the plus side, if you do have downtime issues then they would offer a prorated refund. The support, while quick to answer, is not always the greatest. I always expect some support representatives to be more knowledgeable than others. People who have been working support longer are bound to know more than people who have just started. There seems to be a bigger deviation with WebHostingHub than other hosting companies, though. Eventually you will get any questions answered, but sometimes it may take longer than you would like. WebHostingHub is a good host, albeit on the more expensive side of the spectrum for personal websites. While they don’t have much room for your website to grow, being the sister company of Inmotion is a big plus. If your website needs it, you should be able to transfer to an upgraded plan with Inmotion with minimal fuss.